OmniTrustTM Vinyl Exam Gloves Non-Sterile, Powder Free – item #31211, item #GL31211 powder free examination gloves are made from the best quality polyvinyl chloride and are produced with DINP, a safer alternative to DOP/DEHP found in other brands of vinyl gloves. 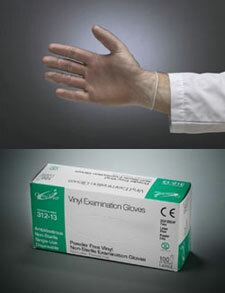 Non-sterile, powder-free vinyl exam gloves are an excellent non-latex value for low risk applications. Formulated for comfortable fit and tactile sensitivity. This ambidextrous glove has a beaded cuff and a smooth finish for improved feel. 100 per box. Select size when ordering.